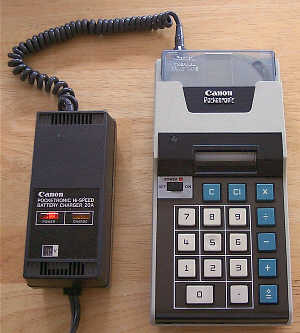 The Canon Pocketronic is a history-making calculator, being the first "handheld" battery-powered printing electronic calculator. The Pocketronic was also one of the earliest calculators to use Large Scale Integrated(LSI) Circuits to provide the 'brains' for the calculator, making it small enough to be easily carried around as opposed to other printing calculators of the day that were desktop behemoths. Along with making history as the first handheld printing calculator, the Pocketronic also has an interesting history behind its development. The Pocketronic was preceded by nearly five years by a "skunk-works" project at Texas Instruments. 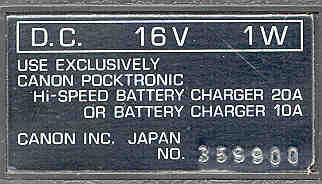 As an outgrowth of the project, Canon and Texas Instruments collaborated to introduce the Pocketronic in Japan in the fall of 1970, and in February of 1971 in the United States. Slightly later, Monroe announced the Monroe Model 10, a repackaged (with a softer, more rounded look) Pocketronic as part of their OEM relationship with Canon. Before going into detail about the Pocketronic, the story of this secret calculator project at Texas Instruments should be told. The story is a fascinating tale of innovation, perserverance, and the magic that can be created when the right team of people come together with a lofty goal. In 1965, Texas Instruments(TI) had pretty much perfected it's technology for small-scale integrated circuit devices, each of which could contain from four to perhaps twenty logic elements. The market for these devices was mainly commercial -- computer manufacturers, industrial control manufacturers and military electronics contractors. TI executive management felt that the way to really increase the sales of their integrated circuits was to come up with a consumer product that could use integrated circuits in an application that would be irresistable to the general public. Along with this, TI needed an internal initiative to drive its IC technology to the next level. TI's management knew that other manufacturers, such as Fairchild, Rockwell, and Hitachi were working to make higher density integrated circuits, and it was just a matter of time before these competitors would be able to produce large-scale integrated circuits. In fact, in the late 1960's, Rockwell was working in conjunction with Sharp to create LSI IC's for an electronic calculator that eventually resulted in the Sharp QT-8D, the first LSI-based electronic calculator. Alhough the QT-8D was an AC-powered 'desktop' calculator, the introduction of a calculator that was built using LSI technology came as quite a shock to the industry, and fortold a large shakeup in the business. LSI's made possible dramatic shrinkage of the size and price of calculators and at the same time, their capabilities increased. Later, the same Rockwell-designed chips were used in the Sharp EL-8, the first LSI-based "handheld" battery-powered electronic calculator. However, in the mid-1960's, the notion of LSI IC's was a concept that all of the IC manufacturers wanted to move into, but no one really knew how. TI's management decided that an internal project to leverage the development of IC's with higher levels of integration would be a good way to engage the creative energies of their best engineers. A number of ideas for consumer devices that could leverage IC technology were tossed about, including the idea to build a calculating machine that was battery-powered and portable. At the time, such a machine was nothing but a dream -- the technology simply didn't exist. Electronic calculators in 1965 were large, heavy machines that consumed the majority of a desktop. Examples of such machines from that time are the Friden 130, Wang LOCI-2, and Sharp Compet 20. The limitations of integrated circuit technology, though a big hurdle to overcome, was only part of the technology limitations that the anyone trying to design a small, portable calculator faced. There were issues with battery technology; a compact, low-power method for displaying the results of the calculations; circuit packaging; and keyboard technology that all had to be addressed, making the project a very ambitious and difficult to attain goal. With the challenge defined, a small group of TI's best engineers were selected to work on the project, giving the team access to the resources it needed within TI to make the dream a reality. The internal TI project was code-named "Cal Tech", a reference to famous California-based institution of higher learning. However, though the codename for the project implied a connection to the school, there was really no relationship with the institution. The code name simply followed a pattern that had emerged inside TI for naming internal projects after noteworthy institutions of higher education. As it was later realized, this was a rather obvious "secret codename" for a project involving "Calculator Technology". The project was an internal exercise to stimulate creativity, and was never really intended to become a true product. But, as time later proved, the ideas and technologies that the Cal Tech project created advanced the state of the art of calculator technology. The notion of such a project was initially conveived by the then-president of Texas Instruments, Pat Haggerty. At one point, Haggerty happened to end up on the same plane flight as Jack Kilby, one of TI's senior scientists. Haggerty and Kilby ended up sitting next to each other, and chatted during the flight about the possible consumer applications for integrated circuits. As a result of that conversation, the concept of a project to build a handheld portable calculator came to life. Shortly thereafter, Haggerty gave the project to Kilby as the leader of the team. Kilby's claim to fame was his history-making work in the development of the world's first integrated circuit device way back in 1958. Kilby's visionary skills, and expert knowledge of integrated circuits made him a perfect choice to lead this project. Kilby quickly added Jerry Merryman, a relatively new engineer to TI, to the team. Merryman, in his short tenure with TI, had already earned a great reputation for his tenacious engineering abilities. Merryman's skills were in digital design, an area of expertise that was critical for the design of an electronic calculator. Another member of the team was James Van Tassel, an expert in creation of prototype hardware. Van Tassel had a wide range of skills that would be applicable to the Cal Tech project, including manufacturing, materials science, mechanical engineering, and electronics. Many other folks inside TI were also involved in the project, however, only from a peripheral point of view. Only a small core of people were aware that the pieces of the project they were working on were part of a project to build an electronic calculator. Even though the codename for the project was somewhat transparent, the secret did manage to stay relatively secure within, and outside of TI. The project rolled along at a healthy pace, with a lot of marathon design work. Merryman spent his initial time designing the logic for the machine, while Van Tassel worked on designing a small, reliable keyboard for the machine. Once the logic design of the machine was sketched out, Merryman decided to bypass building a prototype of the logic, and instead opted to translate the gate-level design directly to LSI integrated circuits...a bold move, considering that the design hadn't been tested, nor was anyone even sure that the IC's could be built in the first place. The problem was that at the time, most of the IC's built to might contain 20 or so logic elements. Merryman's design would require about 150 logic elements per chip in order to fit the logic within the confines of a portable hend-held device. Merryman worked very closely with the IC fabrication people at TI, using TI's latest MOS (Metal-Oxide Semiconductor) IC technologies to cram as many devices per chip as possible. Using conservative design rules (design rules are aspects of integrated circuit design that define things like the size and spacing of circuit components, and the width and spacing of interconnections between components), and actually putting more devices on the chip than actually needed (essentially, adding extra 'spare' gates to the chip) to hopefully make the IC's a practical reality. 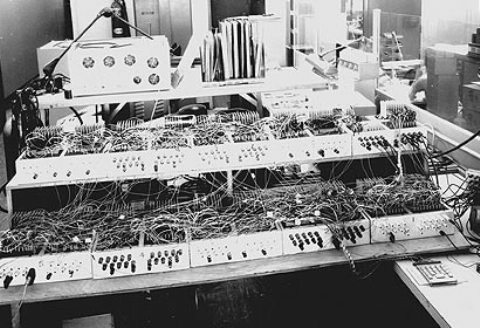 Once all was said and done, Merryman's design was able to be crammed down to four large-scale integrated circuits, each containing about 150 individual logic elements. The first runs of the IC's were disappointing -- none of them worked. But, Merryman's foresight in over-designing the chips allowed for extra logic elements on each chip, essentially making on-chip spare logic elements. At this point, given that a way needed to be found to figure out what was wrong with the chips, it was clear that some method for testing the chips was needed. A functional equivalent of all of the logic on the chips was built that used a couple hundred small-scale integrated circuits. Through use of this 'blown up' implementation of the calculator's logic, Merryman was able to compare the chip version of the logic with the small-scale IC-based version, and isolate the faulty logic elements on the chips. 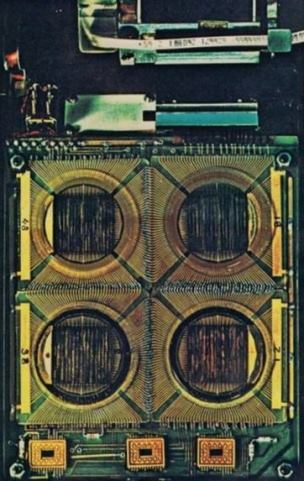 Once the faults were isolated, "patching" techniques (essentially rewiring defective portions of the chip to utilize the designed-in spare logic elements, all under a microscope) were used to fix the defects. Through these methods, a few sets of working IC's were created. In the meantime, Van Tassel had come up with a keyboard design that was small, inexpensive to manufacture, and reliable. Two major hurdles had been overcome. The next step was to figure out how the calculator would display its results. At the time, display technology involved power-hungry Nixie tube or other types of gas-discharge displays that required high voltages to operate. LED's (Light Emitting Diodes) were a laboratory curiosity, and LCD's (Liquid Crystal Displays) did not exist. None of the existing display technologies seemed suitable. It was decided that rather than simply displaying the results, some form of printing output would work better. A good part of the market for such a calculator would be for accountants and bookkeepers, who generally need some printed output to error check and document their results. At the time, most printing calculators used a various impact technologies to form their output, involving the use of electromagnets and rotating embossed drums, all too large and power-hungry for a handheld, battery-powered device. As it would happen, another group inside TI was working on a thermal printing technology. This seemed to be a technology that could be adapted to the Cal Tech team's needs, so Merryman got in touch with the group doing the work, and, after a few fits and starts, a mechanism that could print 'ticker-tape' style on a special thermal paper was devised that met the space and power-consumption requirements. 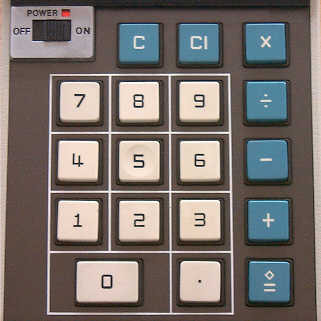 The last major design hurdle was that of providing power for the calculator. It was decided that the device should be powered by re-chargeable batteries. At the time, the only reliable rechargeable battery technologies were Lead-Acid batteries like used in automobiles, silver-zinc batteries which were expensive, and Nickel-Cadmium rechargeable cells, which were a relatively new technology at the time. Initially the project team decided on Silver-Zinc batteries, but during the project, an improved type of Nickel-Cadmium battery was introduced and the final Cal Tech prototype ended up using eleven NiCd battery cells packed into the base of the calculator. The four large ICs are logic arrays making up the calculator's logic. By late 1966, all of the design aspects had come together, and a fully-operational version of Cal Tech was demonstrated to a few insiders at Texas Instruments. 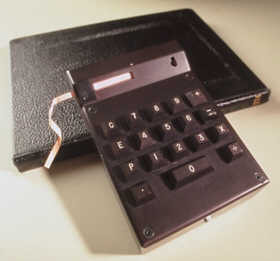 The completed device was a technological triumph, packing a complete four-function calculator that was a little over 4" x 6" x 1 3/4" in size, weighing just under 3 1/2 pounds. In June of 1974, Kilby, Merryman, and Van Tassel were granted US Patent number 3,819,921 for their "Miniature Electronic Calculator". Even though the original idea for the project was to come up with a consumer product that could leverage the use of integrated circuits, TI management realized that their company wasn't really a consumer product manufacturer. TI was an electronics component company, not really in the position to become a large-scale manufacturer of consumer electronics. The real intent of the Cal Tech project was to ratchet TI's IC technology to the next level, which the project did very successfully. 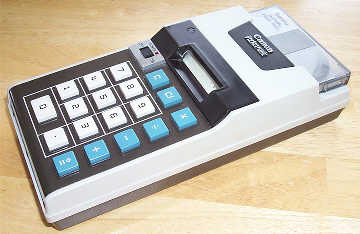 Rather than be content with just that success, the Cal Tech calculator was shown around to a number of different consumer electronics companies as a concept for a potential consumer product. Canon, already successful in the electronic calculator market, showed a great deal of interest in the idea, and a partnership was formed, with TI providing the IC's, and Canon providing the design and manufacture of a comsumer version of Cal Tech. 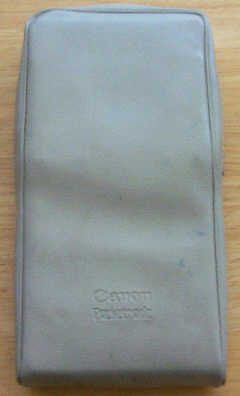 The result was the Canon Pocketronic. During the course of the Pocketronic's development, refinements were made in the design, allowing further integration of the electronics, as well as making the design more 'user friendly' than the Cal Tech. The result was a very streamlined, aesthetically pleasing design, retaining many of the original design aspects of the Cal Tech prototype, including rechargeable battery power, ticker-tape style printout, and basic four-function math capability. 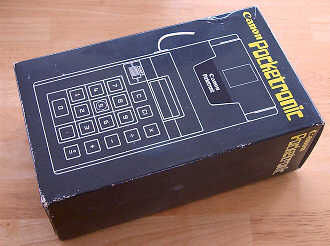 The Canon Pocketronic is a very basic four-function calculator, with a capacity of twelve digits. The Pocketronic utilizes a fixed decimal point logic, with four digits behind the decimal point. 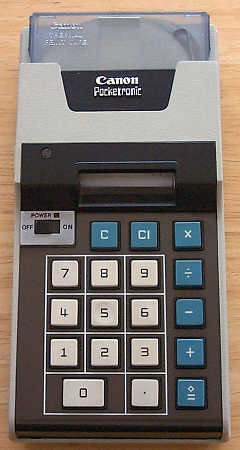 The calculator uses a rather unique cross of arithmetic and algebraic input logic, with four keys representing each of the four basic math functions, and a fifth key acting as a 'print answer and clear' key. The keyboard of the Pocketronic was implemented using different technology than Van Tassel's original Cal Tech keyboard. By 1970, keyboard technology had come quite a long way, and Canon had other technologies for keyboards that were inexpensive and reliable for use in the Pocketronic. The layout of the Pocketronic's keyboard is very straightforward. The keyboard consists of a total of seventeen keys. The keycaps use moulded in legends, which eliminate the wear problems associated with screened-on keycap legends. The standard zero through nine and decimal keys are grouped together in conventional fashion. The four math function keys for addition, subtraction, multiplication and division are located to the right of the numeric keys. The "C" key (which clears the calculator), and the "CI" key, which clears any partially entered numbers (for entry error correction) are located above the numeric entry keys. Lastly, the "Diamond =" key serves as a 'calculate and print' function that completes any pending math operations, causes the final result to be printed, then clears the calculator for the next math operation. On the left side of the calculator, above the numeric keypad, is the power switch, a simple slide switch with a small window that shows red (via a red-painted area on the slider of the switch) when the power switch is in the "ON" position, and black when the switch is "OFF". Above the keyboard is a plastic magnifying window that allows the user to read what is printed on the tape. The thermally-sensitive tape is provided in special cartridges that snap into place in a slot at the back edge of the machine. The cartridges are made of a tinted plastic, allowing the user easily see how much tape is left in the cartridge. Each cartridge contains 80 meters (262 feet) of tape, claimed to be good for about 3000 typical calculations. When a cartridge is empty, it is simply discarded and replaced with a new cartridge. 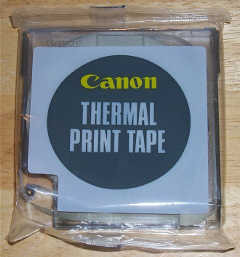 Canon marketed five-packs of thermal tape cartridges. Given that every operation was recorded on the tape, having a good spare supply of thermal paper cartridges was a good idea. The thermal printer in the Pocketronic is of similar design to that used in the Cal Tech prototype. The Cal Tech used a simple roll of the thermal paper which had to be placed inside the machine and manually threaded through the paper path. This would have proved tedious for consumer use. 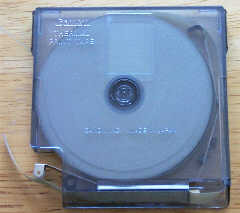 The result for the Pocketronic was the thermal tape cartridge. The cartridge has a slot in its plastic housing that allows the thermal print head to come into direct content with the thermal tape. A felt pad with a tensioner on it (spring steel) provides the pressure to push the thermal paper against the print head. 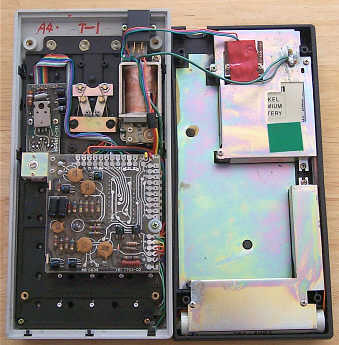 Inside the calculator, a solenoid-activated ratcheting assembly turning a rubber capstan provides the transport that moves the strip of thermal paper across the printhead and out the side of the calculator. Characters are rendered in a 5x7 dot-matrix pattern (as opposed to the less-readable 3x5 dot matrix pattern used in Cal Tech). The printhead is composed of a row of seven solid-state heating elements that heat the paper to form dots on the thermally-sensitive paper as the transport moves the tape through the machine. A serrated metal cutting bar on the edge of the slot where the tape exits the machine allows for easy tearing off of the tape. Internally, the Pocketronic is quite simple. There are three small circuit boards that make up the electronics of the machine. 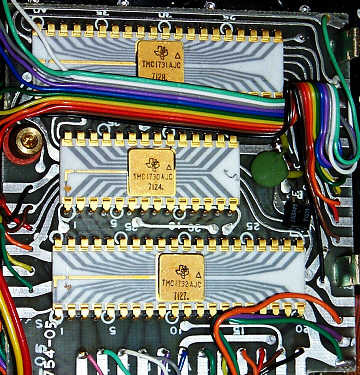 The circuit boards are connected to one-another as well as to the keyboard via ribbon cables. One circuit board provides the master clock and timing circuitry, some power-supply conditioning circuits, and the driver for the paper advance solenoid, all implemented using discrete transistorized circuitry. Another board, sandwiched under the clock/driver board, is the home of the three LSI (Large Scale Integration) IC's that contain the logic of the calculator. Lastly, a third small circuit board has the discrete component driver circuitry for the thermal printhead. The circuit boards are made of fiberglass, and have etch on both sides of the board, and plated-through feedthroughs connecting the wiring on both sides of the circuit board. The LSI IC's are packaged in ceramic dual-inline packages, with gold plated leads. Two 40-pin devices (TMC1731 and TMC1732), and one 28-pin IC (TMC1730) make up the compliment of IC's in the calculator. Date codes on these IC's place their manufacture near the middle part of 1971. 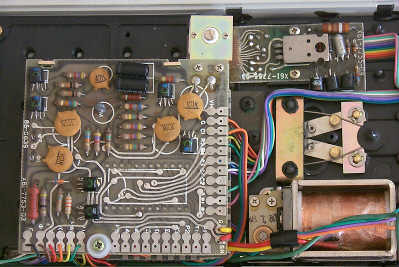 Along with the circuit boards, a small solenoid (in the lower-right corner of the photo above) provides the 'kick' that advances the thermal paper, via a ratchet-style mechanism. This solenoid-activated paper advance system results in a very unique noise as the paper is moved through the printing path and out of the calculator. The noise is quiet enough to not be disturbing, and has an almost pleasant rhythm to it. It takes about 2 seconds for the printer to print out a complete 12-digit number, including sign and decimal point. The printer prints out numbers and math operations as they are entered, allowing the user to view the entries through the magnifying viewing window. The bottom half of the case contains the Nickel-Cadmium battery packs that provide portable power for the calculator. The batteries make up the bulk of the 1.8 pound mass of the machine. A total of seven NiCd cells combine to provide the +7.2V and -8.4V supplies that the machine operates on. The batteries are shielded from the rest of the electronics in the machine by a metal shield, that also serves to limit the RFI (Radio Frequency Interference) emanations created by the logic of the calculator. The specifications for the calculator list a run-time for the calculator of approx. 3 hours on a full charge of the batteries. Two different external battery chargers are available for the Pocketronic. Both provide the ability to charge the Nickel-Cadmium batteries in the machine. The Model 10A is the standard device, in the form of a 'Wall-wart' style battery charger. 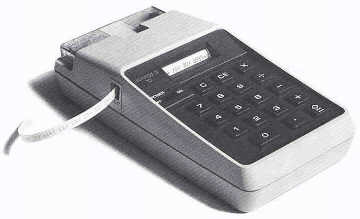 The Model 10A can only charge the batteries, and does not have sufficient power to provide for AC operation of the calculator. The Model 20A "Hi-Speed" power supply (pictured above) is a larger device that provides for charging of of the NiCd batteries in the calculator as well as allowing the calculator to operate from the AC line. The Model 20A charger also provides a much faster charging time, putting a full charge on the batteries (with the calculator off) in just three hours. The Model 10A charger takes about 13 hours to bring the batteries to a full charge. Answers are printed with leading zeroes suppressed. Trailing zeroes are not suppressed. If a number is negative, a leading '-' is printed. Inputting a number that is too large (greater than 8 digits in front of the decimal point, or more than 4 digits behind the decimal point) causes an input overflow to occur, locking the keyboard such that no more digits can be input. Pressing the "CI" key will unlock the keyboard, with the calculator printing a "E" followed by a couple of spaces to indicate the fact that the previous entry was cleared, along with clearing the numeric entry register. If a calculation overflows the capacity of the machine, a "C" is printed at the point of the overflow, and the calculator is cleared. The actual operational speed of the calculator is difficult to measure, as the printer limits the rate at which the machine can operate. The specifications for the calculator list "Calculating and Printing Time" as taking a maximum of 2 seconds.